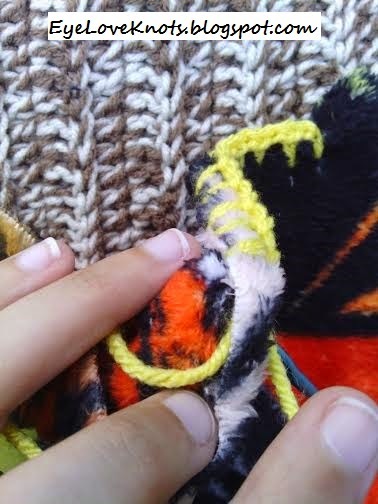 My mom loves to crochet edgings around receiving blankets to give as gifts. She keeps telling me how easy it is and that I should try it too but I’m stubborn and kept putting it off. Last week, I received an email from Joann‘s saying Fleece was on sale so I decided to visit my local Joann’s to pick some up. 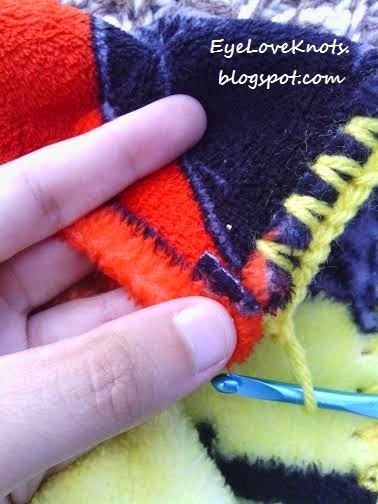 Below, you will find my free pattern and Ultra Cuddle Fleece fabric review. Enjoy! 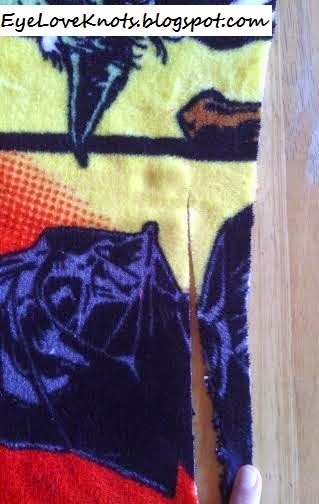 *Side Note: Based on my experience with this fabric, I do not recommend the ultra cuddle fleece for a baby. It’s better for children 3 years and older. 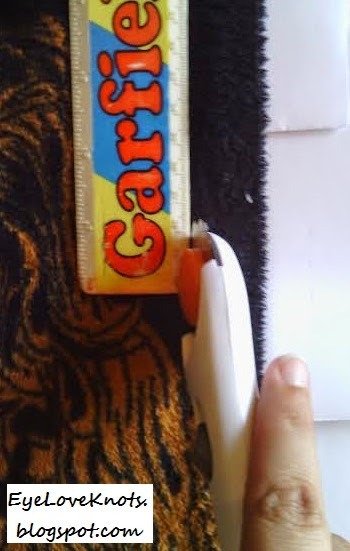 *For ultra cuddle fleece – I DO NOT RECOMMEND using the skip stitch blade. 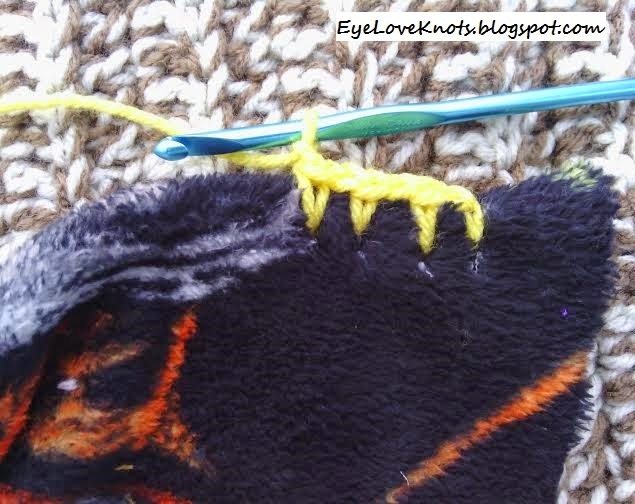 I recommend just using a hook with a semi-sharp end or using a needle and thread to create the blanket stitch. See notes on Ultra Cuddle Fleece below. Ultra Cuddle Fleece: During my trip to Joann’s, I found it rather difficult to choose just two yards out of all of the great options available. My inspiration was my little cousins, Tyler and Madison. 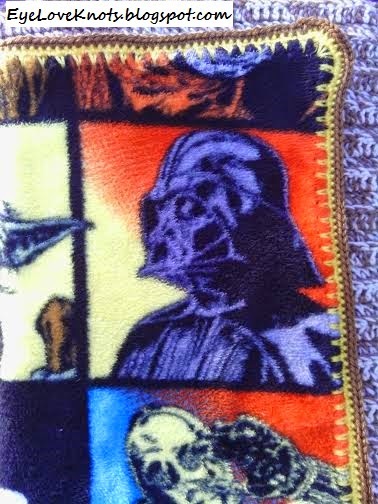 Tyler is obsessed with Star Wars hence the choice of the Star Wars fleece. Madison is a girly girl. You will see my choice for her tomorrow! 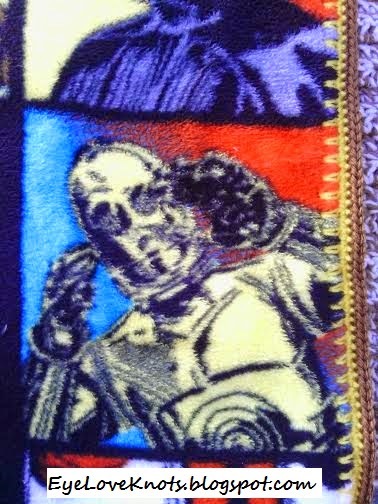 Along with all the great theme options, I also found five different types fleece. 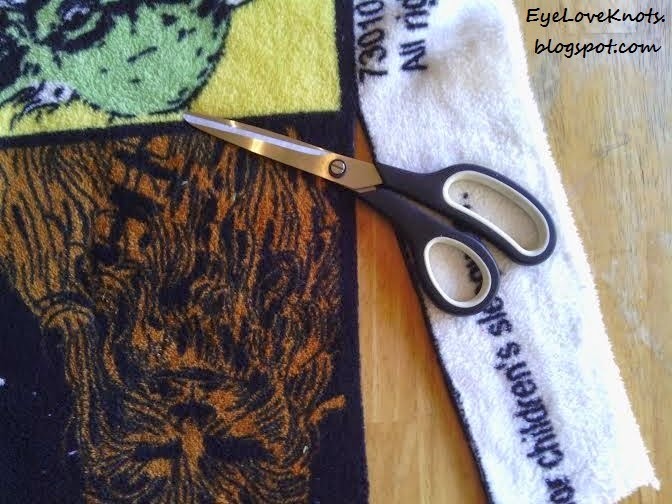 I am not a sewer or quilter and not really familiar with the different fabric types so to guide my choice, I took a look at the No Sew Throw kits to see which type of fleece they use. Then, I went back to the fleece. 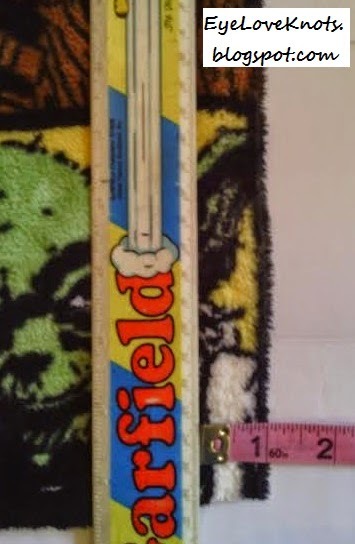 I decided to get a yard of the Anti Pill fleece (same as kits) and one yard of the Ultra Cuddle Fleece so I could test the differences myself. 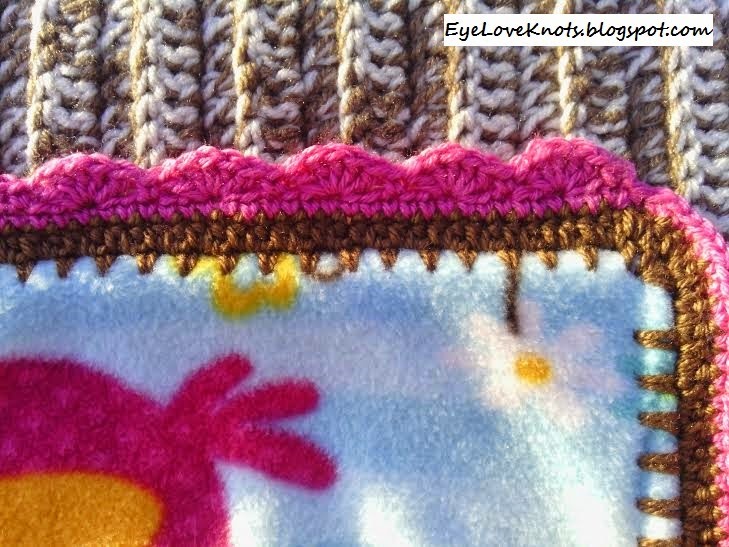 You will find out about the Anti Pill Fleece in tomorrow’s post! After completing all steps up to the crocheting of the foundation round, I found that the Ultra Cuddle Fleece is quite fragile if you will. 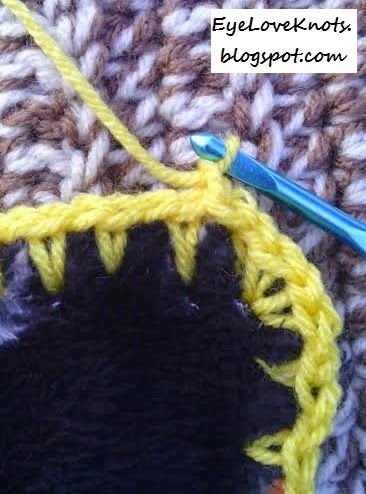 The netting that holds it all together, is rather loose making it much easier to push the head of a not-so-dull crochet hook through WITHOUT the need for the perforation. 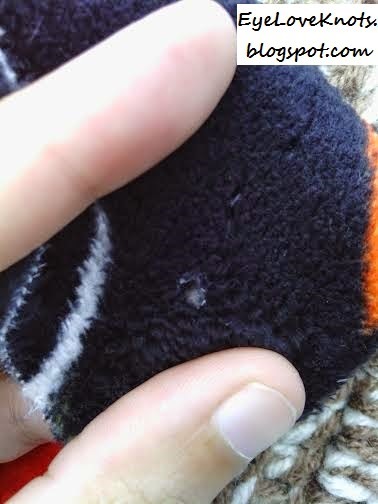 I found that with the perforated holes, the fleece tended to tear. 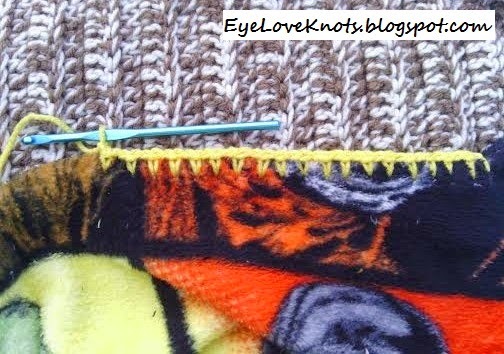 I felt like the hole time I was crocheting around the fleece, I had to be extra carefully not to tear the fleece further. 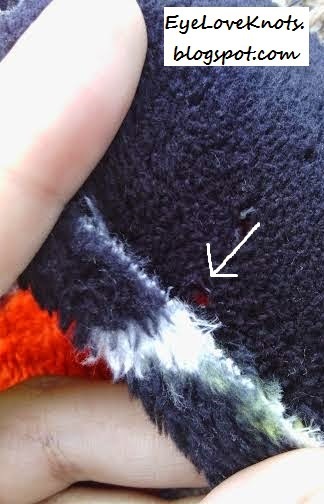 CONCLUSION: DO NOT USE SKIP STITCH BLADE on Ultra Cuddle Fleece. 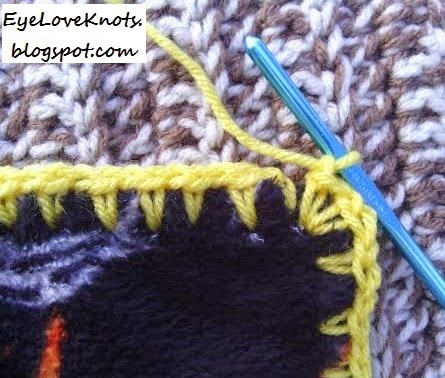 Rather, use a not-so-dull crochet hook to make the holes OR use a needle a thread to create a blanket stitch for the foundation. It took me approximately three hours to complete this blanket including the cutting, crocheting and sewing up of the torn areas. 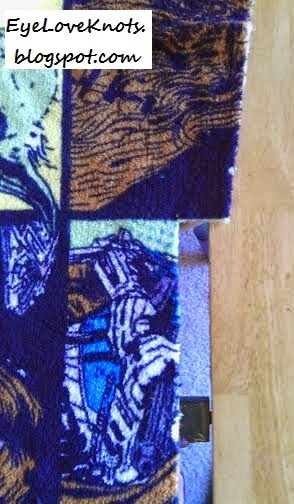 Before adding the crocheted border, I cut the fleece to measure 44″ long by 33″ wide. 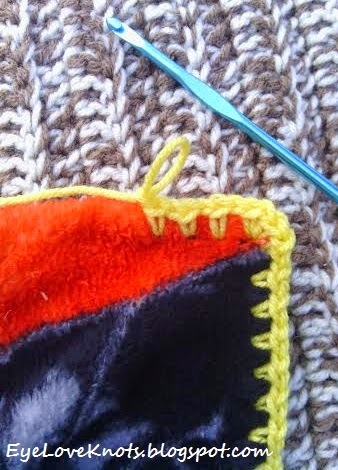 I worked around the existing squares on the fleece. 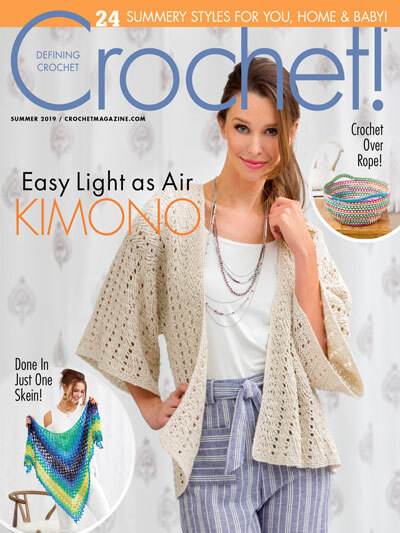 After adding the crocheted border, the blanket measures 42″ long by 32″ wide. **See the pattern below to find out why it got a little smaller. 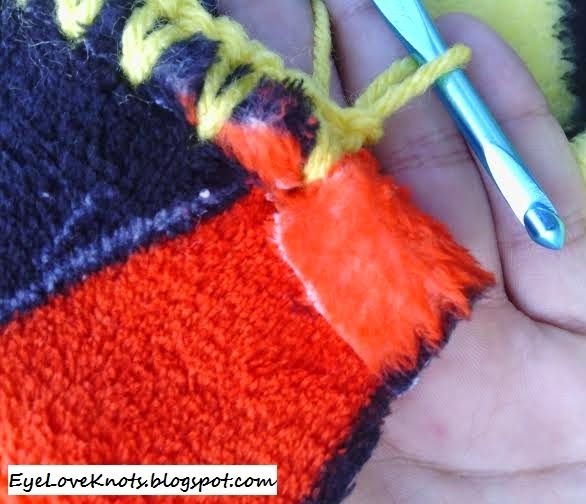 To work a blanket stitch, I found a really great tutorial courtesy of Kelli and Greta of Holiday Crafts and Creations – How to Do Blanket Stitch. First, remove the fine print section. don’t get any of the white line. 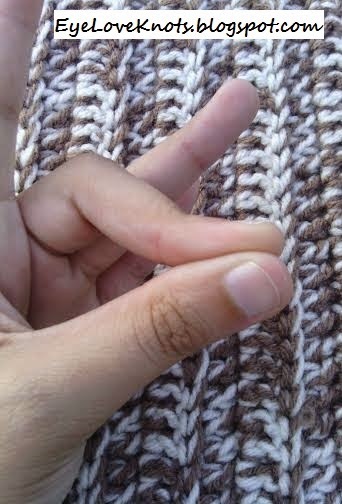 uneven-ness that I had received. Yuck! uneven squares – I had to rework it. View of the other end of my evening attempt. that I would be perforating at the 1″ mark. then stacked them in piles of 5 sheets. This is what the hole with look like. This is the back view. The arrow shows the hole. 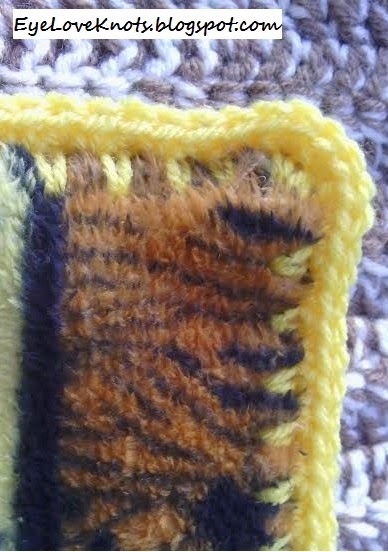 Front view of first four stitches. SC in the ST, CH 1, (SC in next ST, CH 1) across to corner. Back view of first four stitches. crocheted over both of them. finger and moved it around until I found the hole. Similar to putting on studded earrings. Front view of the first half of first side. SC in same ST, CH 1, SC in same ST, CH 1. Then, (SC in next ST, CH 1) across to next corner. Repeat this process all the way around. ST, CH 1. Join to the first ST.
Then CH 1 to begin the next round. 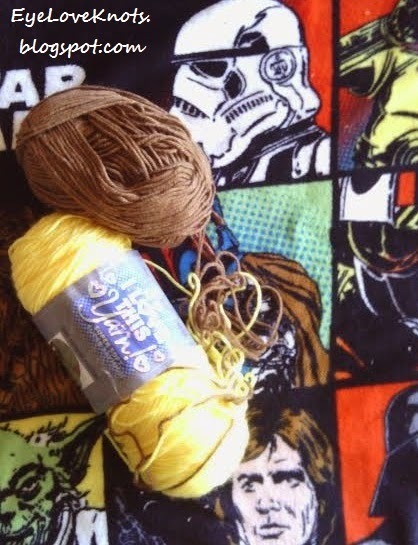 You’ve finished the foundation round of your blanket! 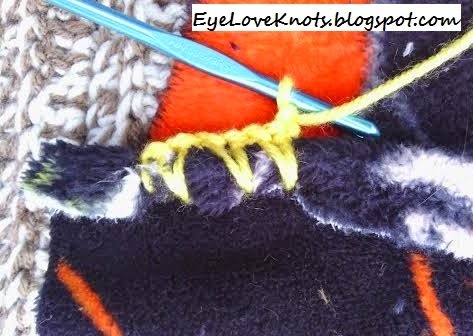 just the blanket stitch around them. You’ve finished the first round of your blanket! 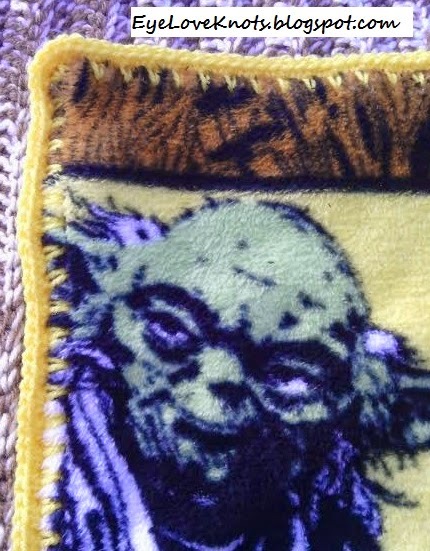 You can leave your blanket like this if you want. Join to first SC. Here I fasten off. (with increases in each corner). Finished Round Two! Now just weave in your ends! and stitch up the tears. I don’t have any photos of this. 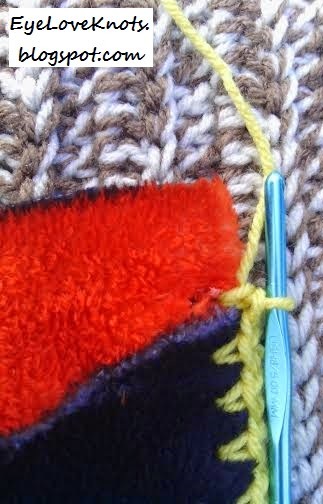 Don’t Crochet but Interested in Purchasing an Ultra Cuddle Fleece Toddler Blanket with a Crocheted Edge? 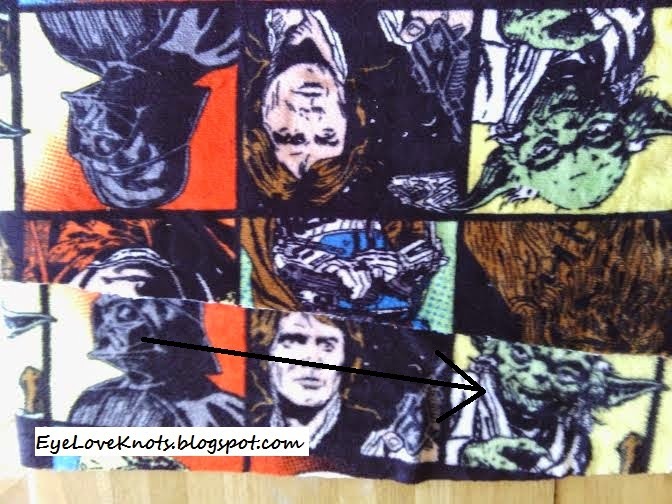 Licensed fabrics are not to be used for commercial purposes so I will not be able to sell any of these Star Wars blankets but I am happy to make other blankets with the crocheted border. Find some options here: Ultra Cuddle Fleece, Anti Pill Fleece, I Love This Yarn (for border), Red Heart Soft (for border). Feel free to send in your custom requests! Visit my Etsy shop for other baby blankets! 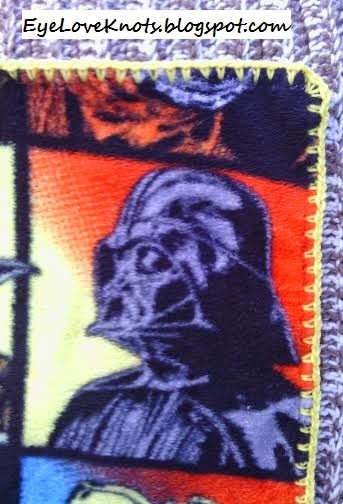 Any licensed fabric blanket would be a great gift to donate to a local children’s hospital. Make sure to contact the volunteering department of the hospital first for rules and regulations for handmade items. I plan on making some to donate! Here’s a preview of what’s to come tomorrow! Make sure to check back then!! 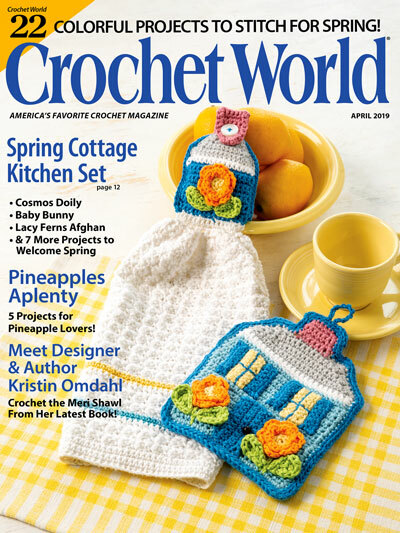 It will include a free pattern and fabric review. This one is a sturdier, better option for babies (though made for my toddler aged cousin, Madison). 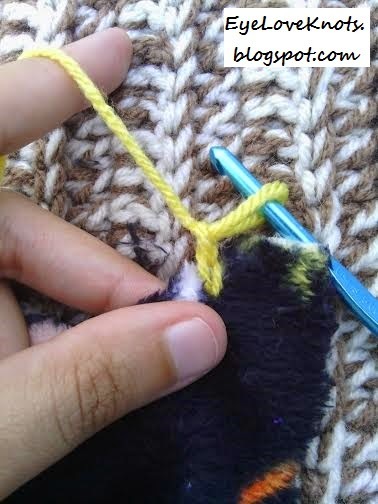 Thanks for sharing your blog is a great resource for me, I want to get back into knitting again! I'm still trying to work with the features and setting that Blogger has to offer. I'm not very tech savvy so it is a tiny challenge. 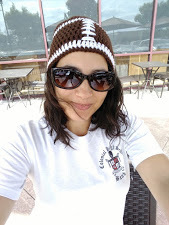 I have visited your Etsy shop and soon will start venturing out into design things. They have a few different ones to choose from! I only saw two of them at my local Joann's store but I found many more on their online site. My suggestion is to pick the AntiPill Fleece over the Ultra Cuddle one that I picked. It's sturdier.